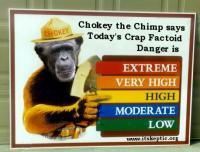 Chokey the Chimp says today's Crap Factoid danger is HIGH. Axios Systems have released a classic piece of crap that will spread rapidly. Watch your shoe soles. Axios have put out results of a survey "Implementing an IT Service Management Solution Can Save a Business More than $500,000". It is the usual bull crap but in these hard times talk of savings will get lapped up. Suddenly everybody has stopped banging on about the benefits of ITIL and ITIL is now all about savings. This will get around - we already have one fairly unpleasant sighting (thanks ServiceSphere). Well duh, over half of IT professionals are over average height, just. Within statisitical variation, this tells me ITSM might save you money or might not - line ball, no way to tell. The best bit that is causing all these trumpeting headlines is "almost 15 percent saying the savings exceeded half a million dollars". Allow me to rephrase that: an overwhelming majority of respondents report that ITSM initiatives return less than half a million dollars in savings. There is zero data captured about what those initiatives cost, but half a million is about an average all up cost so we can conclude that majority of ITSM initiatives make no return on the inverstment. So the results are the opposite of how they are being presented - par for the course for vendors. How much weight can we put on these results anyway? Well, none, as usual. "Methodology: Over 250 IT professionals were surveyed at IT industry conferences held in the US during the spring of 2009. " A self-selecting sample of those idle enough to approach an Axios booth at a conference and have time for a survey, selected only from North Americans, got asked questions that we can't see, designed by a vendor pursuing an agenda, which resulted in a data set that we can't see to draw our own conclusions or check the reasoning. A classic Crap Factoid that will turn up in PowerPoints everywhere - you watch. Why do people continue to do business with companies that insult their intelligence? Submitted by AlexonITIL (not verified) on Wed, 2009-08-12 11:36. I too found SaaS PR hype by BMC, it spoke so much about Cloud computing but actually did not offer anything for users. For so much talk about Amazon EC2, I couldn't find a AMI for BMC Service Desk Express or any other product. When will companies get real and start talking with a real voice. Submitted by bobgrins on Thu, 2009-08-06 16:07. I gotta object to one point, Chokey. Saying "over half of IT professionals" is not the same thing as saying, "above average." The survey could have gotten "4 out of 5 IT professionals" or "1 in 10," saying they saved money, so the average response wouldn't automatically be "half." There is lots of nonsense in their claims, so no need to make up things to object to. I'd be curious to find out how they defined, "saved money." Do they have faster implementations, fewer failed changes, lower service desk call volumes or did they fire 1/3 of their IT Staff? And did they account for all implementation costs, including soft costs like staff time spent on training, implementing the new system, etc. Defining a Cost and a Cost Savings can be extremely arbitrary, and always favors the one doing the defining (see "jobs created by stimulus package" or "government run health care will reduce costs" for Extreme Crap Factoids). As for who took the survey, I would say it wasn't just people idle enough to approach the booth and fill out a survey; it had to be idle enough to approach the booth and fill out a survey so they can get a T-Shirt, Coffee Mug or Flash Drive Key Chain. Submitted by skeptic on Thu, 2009-08-06 21:11. Bob, my point was that if ITSM neither saves nor loses money on average, then about half of all efforts will save money. "more than half" is marketing speak for about 54%. Statistically it is near enough to half. Any time ITSM saves you money it is solely because of a random fluctuation around the zero point. It might just as likely not have. Submitted by JamesFinister on Fri, 2009-08-07 08:10. I'm broadly with you that in many cases any perceived ITSM savings are hard to pin down to the implementation of ITSM, but that surely isn't the same as saying they never are. My initial scepticism is always about what aspects of ITSM/ITIL have actually been implemented anyway. I'm never sure how an organisation that has a low level of maturity in financial management can make grandiose claims over how much they have saved. Submitted by supportthought on Thu, 2009-08-06 18:56. Over half means between 50% and about 58%, after that it becomes "almost 60%" or "nearly two thirds" from this point onwards it's considered acceptable to add one exclamation point. you may add two exclamation points during a recession!! Submitted by Visitor (not verified) on Thu, 2009-08-06 21:02. I believe Axios actually offer cuddly Polar Bears in exchange for each completed survey at events they attend. They even have a hierarchy of Polar Bears. Small and not-so-fluffy, for the less positive surveys. Large and extra fluffy for the more positive surveys (and potential prospects). Not only that, but part of their perceived event success criteria at events such as the ones attended in NA is measured on the number of surveys completed. Submitted by skeptic on Thu, 2009-08-06 21:10. We now have the Polar Bear Index and the Excalamation Point Indicator as key metrics when critically reading vendor Crap. (I think I'll start capitalising Crap, like we do Service Management). Submitted by JamesFinister on Thu, 2009-08-06 11:45. And of course the respondents were highly unlikely to say their own ITSM initiative failed because of the halo effect and associated psychological bias, which adds another pinch of slat. The last such survey I was involved in developing, against my better judgement, was most interesting because of what it revealed about those completing and analysing the data, rather than what it was claimed to have shown. It claimed to show that most organisations were achieving reasonable levels of overall ITSM maturity but needed to focus on a few neglected processes. Look a little deeper though and it was obvious that those neglected processes were fundamental to overall process maturity AND to the the other processes that respondents were already claiming to be mature in.